The city has yet to release details of a plan that would establish a fee on market-rate housing in order to finance more affordable housing. Affordable housing advocates want the city to implement an impact fee immediately. 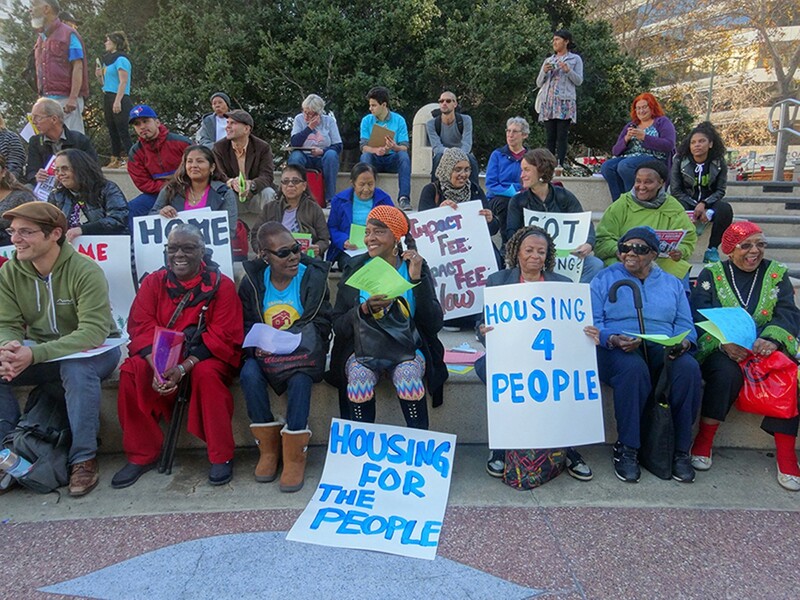 Since the early 2000s, affordable housing activists have been trying to get the City of Oakland to incentivize and fund affordable housing. But each campaign ended without major policy changes. As a result, the city has forgone collecting tens of millions of dollars in funds that could have financed more affordable housing in Oakland. Now, several years into yet another regional economic boom, it appears that the city council may be finally ready to adopt a housing impact fee — one of the most common mechanisms used by cities throughout California to finance affordable housing programs. But as the affordability crisis deepens in Oakland, affordable housing advocates are worried that city officials, under the influence of developers, are dragging their feet, and that the current boom might fizzle before the city actually enacts a housing impact fee. They're also concerned about the city's secretive process for crafting the proposed fee. Oakland's planning department has held several private meetings with developers and affordable housing advocates to discuss impact fees, but the city has declined so far to release its economic research on the feasibility of the fees to the public. In fact, the city has not even released this information to attendees of its private "stakeholder" meetings. In September, city planning staffers invited twenty experts to meet behind closed doors to shape the city's proposed impact fees. The first meeting was held earlier this month in City Hall. The stakeholders group included well-known local real estate investors such as John Protopappas and Wayne Jordan; developer lobbyists, including Greg McConnell of the Jobs and Housing Coalition; as well as several affordable housing advocates and developers. A team of consultants led by Linda Hausrath of the Hausrath Economics Group handed out a seven-page memo and gave a slide presentation to the stakeholder group during its first meeting, but attendees have not been given copies of the city's draft nexus study or the draft economic feasibility analysis for the impact fees — two studies that cities use to calculate the amount of a housing impact fee. Millions of dollars a year for the city are at stake. If fees are set too high, some projects might not pencil out, thereby inhibiting the construction of both market-rate and affordable housing. If fees are too low, or if there is further delay in implementing them, the city will lose millions that could be used to build low-income housing. Jeffrey Levin, policy director of the affordable housing nonprofit East Bay Housing Organizations (EBHO), attended several of the stakeholder meetings. In an email to city staff, obtained by the Express through a public records request, Levin called the lack of information given to participants "disappointing." "Without the full [nexus] study there is no way for any of us to evaluate the assumptions and calculations," wrote Levin. "The policy discussion is now going to be framed by conclusions about a study that no one can see. I'm not aware of any [other] city that has taken this approach." According to city records, an "administrative draft" of the nexus study was completed in June. A draft of the economic feasibility analysis was completed earlier this month. The city council's community and economic development committee is scheduled to consider impact fees at its December 12 meeting, but the nexus study and feasibility report won't be released publicly until next year. "I think it's unusual for a group that's supposed to be made up of technical experts not to get information, and to only get it at the meeting, so they can't absorb it beforehand," said Gloria Bruce, executive director of EBHO, in an interview. In an email, city spokesperson Karen Boyd wrote that the stakeholder meetings have been limited to a small, invitation-only group "to encourage open and honest discussion among the meeting attendees." Boyd also stated that the public can view some results of the nexus study in slide presentations that have been posted on the city's website, but that the full nexus study will not be complete and available for review until February. 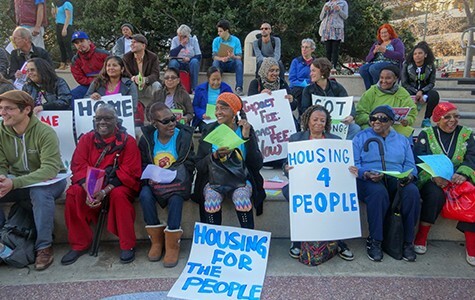 EBHO and other affordable housing activists held a rally last week outside Oakland City Hall calling on the city to make the reports public and to expeditiously pass a fee at a level similar to surrounding cities. A housing impact fee for Oakland could raise millions a year during boom times. Since 2005, San Francisco has raised $89 million to support low-income housing through its affordable housing impact fee, according to the San Francisco Controller's Office. According to the slide presentation prepared by city staff and shown at Oakland's first stakeholder meeting, the maximum legal affordable housing impact fees Oakland can charge are between $34,833 and $81,729, depending on the type of housing unit. Slides from two other presentations shown to the stakeholder group reveal that the city is contemplating a $20,000 impact fee, and that it might be phased in over several years. With more than ten thousand units of housing in Oakland's development pipeline, a $20,000 fee could raise tens of millions over multiple years. Developer Mike Ghielmetti recently told an audience at an event on housing hosted by the pro-urban development group SPUR that if the fee is set too high, and not phased in, it will stifle real estate investment in Oakland, leading to lower overall revenues for the city and less housing. Ghielmetti said he believes Emeryville's recent decision to increase its fee to $28,000 is already slowing down development there. Berkeley also has a $28,000 fee — although the council temporarily reduced it to $20,000. Oakland Mayor Libby Schaaf told the San Francisco Business Times last week that she supports phasing in impact fees so as not to "kill projects that are already entitled, but haven't pulled their building permits yet." Bruce of EBHO said her organization is willing to discuss some kind of phase-in so that developers can incorporate the new fees into their project financing, but she disagrees that a high fee and relatively quick phase-in would kill projects. "This has been a long time coming," said Bruce. "In every conversation we've had with the city about specific plans or development policies, they keep saying there's going to be a nexus study and impact fee, so don't worry about getting anything into these specific plans, or don't worry about community benefits agreement for Coliseum City because there will be an impact fee. "Frankly, the city's leaders have been talking about this for so long, I don't think anyone can say the solution is to just wait for the market to get better and see what we can do," Bruce added. In fact, Oakland has been kicking around the idea of some kind of fee on market-rate housing for more than fifteen years. In 2000, the city council and then-Mayor Jerry Brown rejected an inclusionary zoning policy that would have required a small percentage of apartments and homes in any development to be priced for lower-income renters and buyers, or the payment of an in-lieu fee from developers who didn't want to incorporate affordable housing in their projects. Then, again in 2007, the city formed a blue ribbon commission to make recommendations on an inclusionary housing ordinance. Outgoing Mayor Brown appointed Joseph Perkins, president of the Home Builders Association of Northern California to the commission, a group that has sued cities to undo affordable housing laws. After a long delay, the commission finally met, but the city council rejected inclusionary zoning and several other housing policies that would have supported affordable housing production. Ex-Councilmember Jane Brunner, who advocated for inclusionary zoning during the last decade, said, "[D]evelopers have been opposed to having inclusionary zoning from day one. That included impact fees. In 2008, their argument was that the economy was so bad, it's not the right time to do it. Now, the economy is good, but Oakland is still one of the few cities that doesn't have inclusionary zoning." According to Brunner, Oakland officials have repeatedly rejected affordable housing policies for two reasons. She said Oakland leadership has always possessed an "underdog attitude," believing that the city can't attract enough developers. "They were almost desperate to have development," said Brunner, and so they rejected any policies that developers opposed. "The second reason is financial," said Brunner. "It's campaign finance. Developers contribute a lot to elections." John Protopappas, a member of the impact fee stakeholder group, was Mayor Libby Schaaf's campaign treasurer last year. He made the maximum allowable contribution of $700 to Schaaf in 2013 and 2014. Protopappas also runs a private nonprofit that raised $88,000 for Schaaf's inauguration festivities. Gregory McConnell, whose Jobs and Housing Coalition is funded by real estate developers, made maximum $700 contributions to councilmembers Lynette Gibson McElhaney, Annie Campbell Washington, Rebecca Kaplan, and Abel Guillen in 2014, followed by another $700 contribution to Gibson McElhaney's reelection committee earlier this year. By contrast, Joseph McCarthy, an affordable housing developer with Bridge Housing who also attended the stakeholder meetings, made only $400 in contributions since 2013, all to councilmember Dan Kalb. Gloria Bruce of EBHO made a single $100 contribution to Kalb's officeholder committee earlier this year, and Jeff Levin has not made a single political contribution, according to city records.